MoveOn.org have created a viral email campaign to encourage people to vote in the forthcoming US Presidential election. Accessed here, voters can enter friends details and forward them a personalised email. 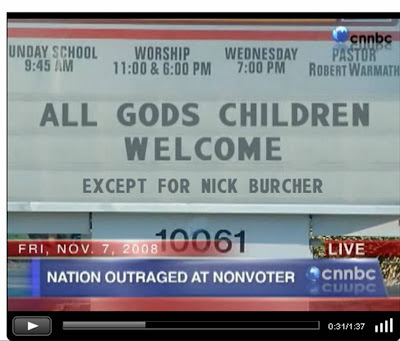 The MoveOn email links to a spoof news clip which personally names them as the reason Obama didn't win! 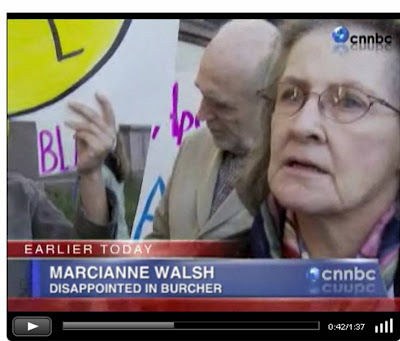 "All God's children welcome, except for Nick Burcher"
"Marcianne Walsh disappointed in Burcher"
I think this is a great example of how email and video can be used together to promote a message. Over 10 million of these MoveOn videos have now been sent and the personalisation of the message is the key momentum builder. 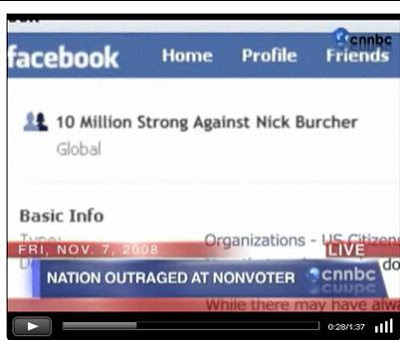 Cleverly executed and another example of how the Presidential election is pushing the boundaries of new media.